I thought I’d give you guys a peek into the insanity er…joy of planning the 2011 Bariatric Foodie Holiday Food Tasting (click here if you are going “The what???”). 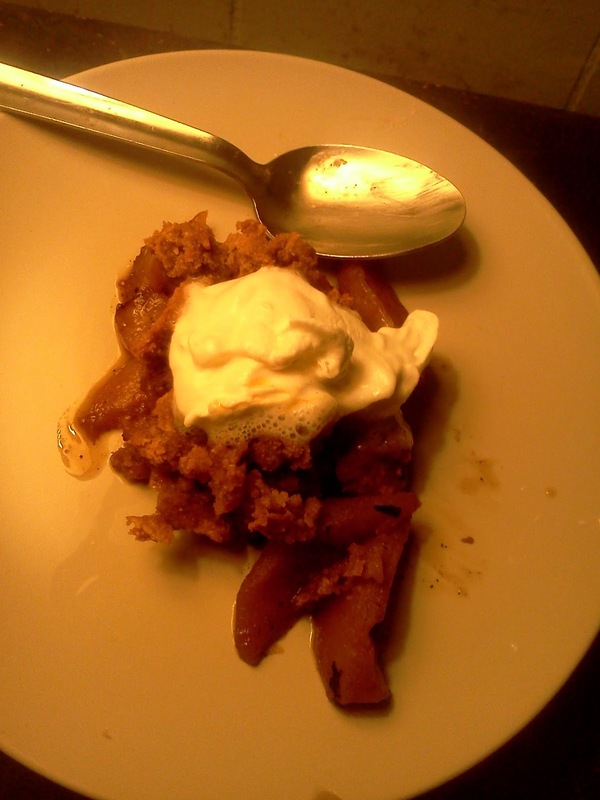 Ultimately I decided NOT to sample out this recipe, so I am sharing it now! But this gives you an idea what yumminess awaits if you attend! It’s basically the same concept as my Apple Brown Nik, with a few tweaks. Spray a frying pan with nonstick spray then melt one tablespoon butter in it (that’s my tip for using less butter without things sticking). Add sliced apples and nectarines and cook until just softened. Transfer to a bowl. Add spices to apples and nectarines and stir. Add flour and stir again. Set aside. In another bowl, combine almond meal, sugar substitute, syrup and butter until a crumbly mixture forms. It should be the consistency of wet sand. It should not be wet. If it is wet, add a bit more almond meal. Place apple/nectarine mixture in a 13 x 9 casserole dish and top with crumb mixture. Bake at 350 for about 15 minutes or until topping is hardened. Now usually I use my beloved Fiber One for the topping (I truly do love it), but I tweaked this to incorporate something else for those who aren’t fans. So…that’s a little sneak peek of what’s going on in my kitchen as we near the big event. I don’t want to give away too many details, but let me just say this recipe PALES in comparison to the dessert recipes I did decide to serve! If you still need to get your ticket, you can do so securely using the PayPal link to your right! I hope to see you there!